Heat advisory in effect today – Welcome to Wyandotte Daily! 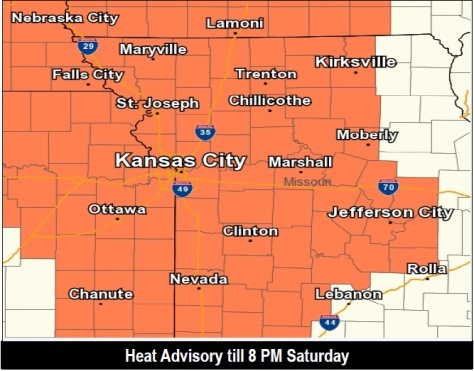 Highs in the upper 90s to around 100 are expected today, and a heat advisory is in effect until 8 p.m. Saturday, July 14, according to the National Weather Service. Temperatures will cool slightly starting Friday, but expect heat index readings over 100 degrees through the end of the work week and much of the weekend, the weather service said. Little to no precipitation is expected through the end of the work week. A chance for storms arrives over the weekend, according to the weather service. Widespread severe storms don’t look likely, but any storms that do occur will likely bring the threat of locally gusty winds and torrential rain, the weather service said. 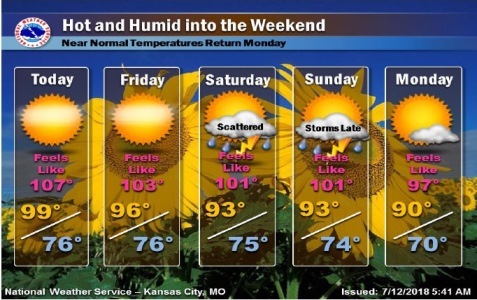 Heat indices will rise to 100 to 105 degrees during the afternoon hours and will be possible today through at least Saturday, according to the weather service. Overnight lows will also remain at or above the mid 70s through the weekend, maintaining the prolonged warm period through much of this week, the weather service said. A weak cold front will settle through the region Sunday night, pushing temperatures back towards seasonally normal values for mid-July, according to the weather service. Today, it will be sunny and hot, with a high near 100, the weather service said. The heat index will be as high as 107. A south southeast wind of 6 to 8 mph is possible. Tonight, the low will be around 77 with a southeast wind of 5 to 8 mph, according to the weather service. Friday, it will be mostly sunny and hot, with a high near 97, the weather service said. The heat index will be as high as 103, with a south wind of 5 to 9 mph. Friday night, there will be a 20 percent chance of showers and thunderstorms after 1 a.m., according to the weather service. The low will be around 77 with a south wind of 5 to 7 mph. Saturday, there is a 40 percent chance of showers and thunderstorms, with a high near 94, the weather service said. A southwest wind of 6 to 9 mph is possible. Saturday night, there will be a 30 percent chance of showers and thunderstorms, with a low of 76, according to the weather service. The low will be around 76. Sunday, it will be partly sunny with a high near 93, the weather service said. Sunday night, there is a 30 percent chance of showers and thunderstorms, with a low of 74, according to the weather service. Monday, it will be partly sunny with a high near 91, the weather service said. Monday night, it will be partly cloudy with a low of 72, according to the weather service. Tuesday, the high will be near 92 with mostly sunny skies, the weather service said. Tuesday night, expect a low of 71 with partly cloudy skies, according to the weather service. Wednesday, it will be partly sunny with a high near 86, the weather service said.